Come and join Addington brass for a wonderful afternoon of brass band classics! We’ll be playing a varied selection of music from familiar composers such as Mozart and Tchaikovsky, as well as your favourite traditional tunes and hymns. Featuring guest conductor Les France. 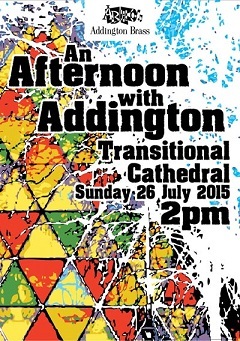 2pm, Sunday 26 July at the Transitional Cathedral. Admission is free so bring all your friends and family along!